With the emergence of vector-borne diseases, population pressure and unhealthy living conditions, a very focussed approach and long-term planning is needed in disease control. If all human-made changes and pressure of unscientific exploitation of natural resources are not halted, the planet Earth will not remain a habitable place. The case of malaria is an example of how excessive reliance on insecticides has damaged the environment and harmed public health. Malaria has returned. Ironically, ddt the so-called panacea, instead of eradicating malaria successfully eradicated malariologists, leaving blunted tools of the malaria eradication era in our armament. Malaria has had the last laugh or rather a lasting laugh. Re-visiting the earlier works on malaria control before the arrival of ddt one finds a close link between malaria control and the engineering. Water management was the main strategy of malaria control. This was practiced almost throughout the world -- in the usa Tennessee Valley, Indonesia, Malaysia, India, Sri Lanka, Caribbean islands, the list is long. The works of those days are still the classical examples of cost effective and sustainable malaria control. Unfortunately malaria-infested countries were poor and lacked resources, the rulers exploited the hapless societies, masses remained ignorant of their rights and privileges. Therefore, although many techniques of successful malaria control were known large-scale application was not a gainful investment to the rulers. The methods were applied in isolated places of economic and military importance. In India at the time of independence, malaria was a great scourge in our society, killing an estimated one million people each year. Malaria was known as the king of diseases. The arrival of ddt changed this scenario. 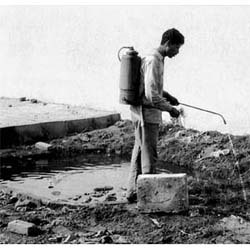 ddt spraying was a spectacular success in malaria control. The euphoria of success was so strong that malaria eradication seemed imminent. But, malaria was never eradicated, only reduced to low levels waiting for an opportunity to emerge again. This is precisely what happened in India and in other tropical countries. Resurgent malaria developed new forms such as the vectors developed resistance to insecticides, learnt to avoid resting on the sprayed walls, the parasite developed resistance to anti-malarial drugs and it occupied new niches created as a result of some unplanned developments -- the human made malaria. The fact that spraying households is largely unacceptable was a wake up call to the scientific community. Yet, malaria control relied exclusively on chemicals, new chemicals and more chemicals. Today malaria is more lethal and its treatment many times more expensive than at any other time. Losses due to malaria are mounting, and even a conservative estimate may suggest a loss of at least one billion dollars annually to the country. Spending on malaria accounts for 30-35 per cent of the health budget of the government of India, and malaria remains a high economic burden for the state governments. There is no respite from the march of malaria and mounting economic losses. In rural India people are wise and understand mother nature. Over the years societies have become more open and demanding. There is a quantum jump in the information system even in the remotest areas of the country. This awakening is the beginning of a change. Change based on demand for equity. Conscious of their environment and continued neglect, communities are challenging the government in the court. Malaria control cannot be overlooked for too long. The call is there at our doors. Scientists thus developed simple, low cost, indigenous, environment friendly technologies that could merge with local ethos to control malaria in the holistic development of rural India. The technologies are there for the people to adopt. Thus there is hope, and the hope lies in rational and simple ecological approaches. In the development of bioenvironmental control strategy, scientists studied vector biology and the ecology in which they mature. They applied modern techniques to incriminate vectors; discovered sibling species complexes; studied their biology to find that each sibling species differed in response to insecticides, biting time, longevity and other traits. These findings had tremendous implications on malaria control. The attack on vectors became more focused and cost effective. While basic research continued, a new thrust was given to malaria control through applied field research. Innovative strategies of vector control were developed and field-tested. Old and new technologies were merged and refined for a cost-effective and sustainable malaria control. Epidemiological understanding of malaria was enhanced using old and new tools of geographical information system in mapping malaria receptivity. Epidemiology of malaria was investigated in various ecological settings of the country and this work led to the discovery of the impact of environmental changes on the establishment of new malaria ecotypes. Scientists at the field stations investigated local malaria transmission dynamics and new control tools; and integrated these to develop cost effective and sustainable methods of malaria control. New techniques of malaria diagnosis and anti-malarial drugs were field-tested and introduced in malaria control. Growing from strength to strength various research inputs gave us deep insight into the role of each mosquito species in malaria transmission and the possible techniques that could be supplied in malaria control. A synergy between intensive research and ecological principles gave birth to the concept of bioenvironmental control of malaria. The technology utilizes vector control by environmental management methods, supplemented by biological control, intersectoral coordinated action to take preventive action on adverse health impact of developments. Community participation was an important component of all the interventions, income generating schemes were linked with malaria control activities and wherever possible the strategy was integrated with rural development programmes towards a holistic approach. A beginning was made in the mid-1980s from Nadiad Taluka, Kheda, and Gujarat. The strategy continued to evolve with research inputs and field experience. Feasibility studies were converted into demonstration projects spread throughout the length and breadth of the country. The srategy was tested in high malaria transmission areas. These areas represented the presence of one or more vectors, changing parasite formula, the problem of drug and parasite resistance and ethnic problems all interwoven in the local ecology. Bioenvironmental methods applied in a scientific manner successfully achieved the goals of malaria control, and at the same time improved the environment, generated employment, and acelerated the holistic development of villages. These methods are simple, low cost, widely applicable, work in harmony with nature and sustainable. The strategy can be followed in remote and inacessible areas with local talents and resources. While cost effective malaria control was accomplished in our hands, an important challenge of the delivery of malaria control through the primary healthcare system still remained. Bioenvironmental malaria control technology was first transferred to Karnataka State. Indigenous transmission has been interrupted whereas sprayed areas are reeling under epidemic situations. This has been achieved in the most problematic and non-responsive population in Hassan District. The technology was adapted by the Maharashtra State and malaria cases in the state have shown nearly 70 per cent reduction and this trend is being maintained. What is interesting is the simultaneous reduction in the use of insecticides.